This is where you can pick up your free Premiere Issue gift from me, Elizabeth Locey. 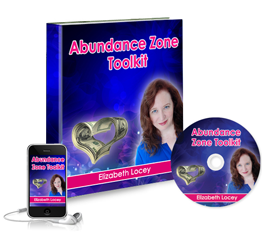 Your special gift is the “Abundance Zone Toolkit” that I referred to in my article, and it contains all the sacred and energetic tools I used to octuple my income between 2011 and 2012. These tools really work, and made all the difference. This audio file walks you through how to recognize whether your energy signature in any given moment is one that will make you magnetic to everyone (friends, family, potential leads or lovers) or … ahem!.. repellent. There may be certain people in your world which you want to repel, and that’s fine, but for your business to thrive you can’t be repelling ideal clients. In addition, I’ll show you through how to flip your energy out of repellant to attractive like a switch, so you’ll never have to have an important encounter wearing the wrong kind of energy again. This audio also walks you through the Divine Love Bubble; it will help to keep your energy signature in the Abundance Zone. And it also takes you step-by-step through the Human Pendulum from Donna Eden, which can help you make on-the-spot decisions that are also spot-on. All entrepreneurs know that the faster we can make decisions, the better our business goes, especially if those decisions don’t have to be un-done later.